Author: Eva Spies. With a preface by: Thomas Bierschenk. Series edited by: Thomas Bierschenk, Anna-Maria Brandstetter, Raimund Kastenholz, Matthias Krings, Carola Lentz. Participative Development refers to a model of collaboration which claims universal application within development cooperation. But if one studies – as done in this book – everyday encounters of developers and the people to be developed, then participative development becomes visible as a specific mode of understanding the unknown which cannot be transferred into different cultural contexts without further ado. Furthermore it becomes apparent that participative development is making contradictory demands on the appropriate dealing with the ones to be developed, because the difference between the developers and those is supposed to be acknowledged and simultaneously negotiated. 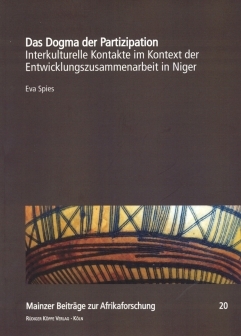 The book is based on an anthropological fieldwork in the city of Zinder (republic of Niger): In interchange with the inhabitants of Zinder the participative ideal of understanding is a premise of many development aid workers for ethical acting; though its paradox demands have a share in the fact that development aid workers’ experience such contacts as a dilemma situation they can only elude by avoiding contacts. So it seems like just the participative ethics of understanding the unknown inhibits a real cooperation. Dr. Eva Spies holds a Junior Professorship for Religious Studies focusing on Africa at the University of Bayreuth / Germany. Until April 2014 she was a researcher at the Department of Anthropology and African Studies of the Johannes Gutenberg-University, Mainz / Germany. Today, ‘participatory development’ is a universally applied and accepted model of development. In focusing on everyday encounters of development agents and those who ‘receive’ development measures one discovers that ‘participatory development’ is a specific mode of understanding the other which may not be applicable in all cultural contexts. Also, participatory development includes contradictory requirements for dealing with partners ‘to be developed’, since the difference between the two sides is at once to be acknowledged and overcome. Spies has conducted fieldwork in the city of Zinder (Niger), where this type of participation is a precondition for ethical action among many development specialists – but the above-mentioned paradoxical situation creates dilemmas for them, often resulting in avoiding further contact – so the participatory approach seems to prevent real cooperation.